H/b, 8 x 13cm, 16p, 3rd edition, May 1942. 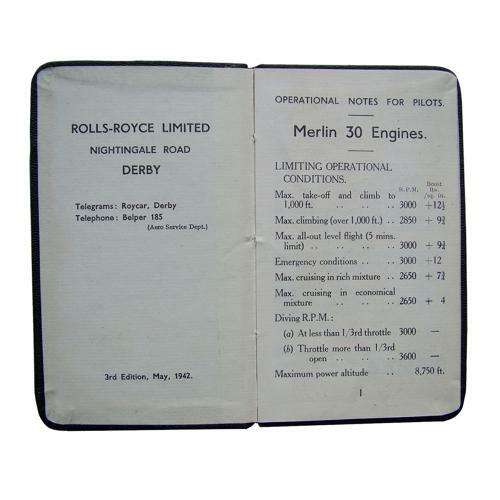 Published by Rolls Royce Limited, Nightingale Road, Derby. Small booklet - 'Operational notes for pilots'. Vital information on the Merlin 30 engine fitted to the Fairey Fulmar and Fairely Barracuda used by the Fleet Air Arm. The gold blocked text on the cover is rather worn/faded, otherwise in very good used condition. Stock code P22873-87.